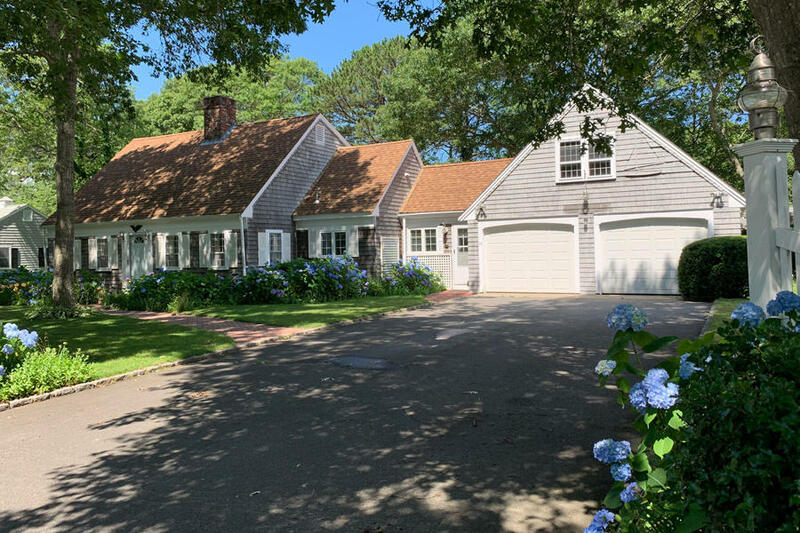 Nestled between 2 golf courses, this beautifully maintained home is the perfect place to enjoy a relaxed Cape Cod lifestyle for year round living, or a Cape getaway. Envision the abundant hydrangeas and daylilies surrounding this picturesque Cape in the warmer months. Enjoy your morning coffee by the cozy window seat in the large, sunny, eat-in kitchen. Entertain in the front to back fire-placed living room. Dine alfresco on the outdoor brick patio, then relax with a good book in the year round sunroom. A master bedroom, updated bath with first floor laundry, and a study complete the first floor. The second level has 2 bedrooms and a full bath. Upstairs plumbing is separate from the downstairs plumbing, enabling the entire second level to be shut down when not in use. Other amenities include central AC, a two-car garage, 9-zone irrigation system, and outdoor shower. A full basement, four-bedroom septic, and above garage space offer future expansion possibilities. Conveniently nestled between Blue Rock and Bass River Golf courses, and close to the some of the finest beaches and boating the Cape has to offer. Solid rental history with 2019 rentals in place.